Today I am sharing a super simple (and sweet) Candy egg math activity we did a few weeks ago. My son love games that use dice and candy... and I love games that teach math skills... so this was a hit with both of us! 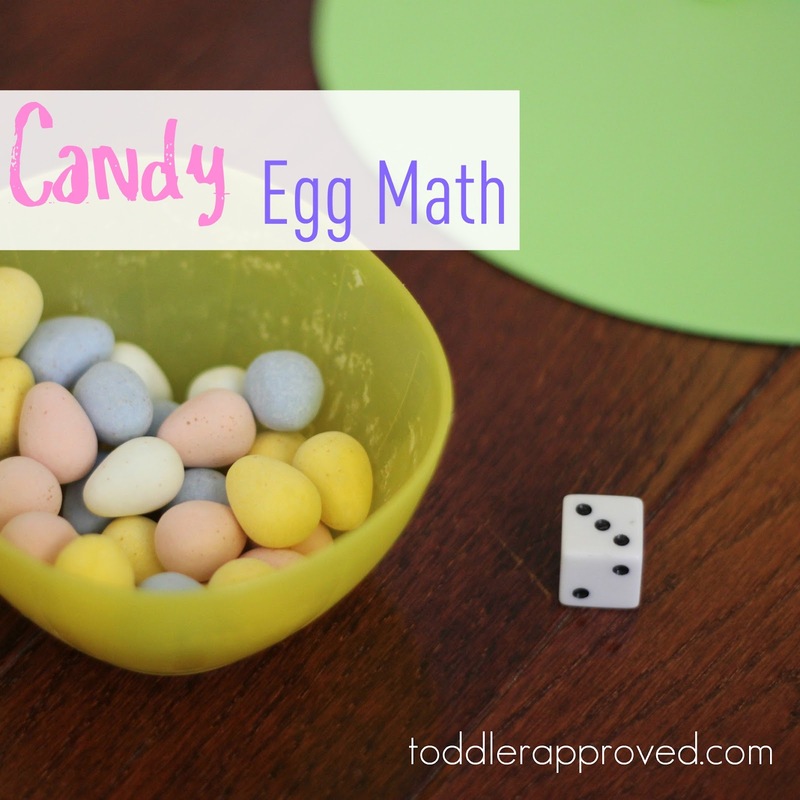 If you saw the eggy math game I shared over at Quirky Momma, then you'll notice an eggy math trend. I love to get as much use out of our holidays materials as we can. These foam eggs from Target have been a big hit! 2. 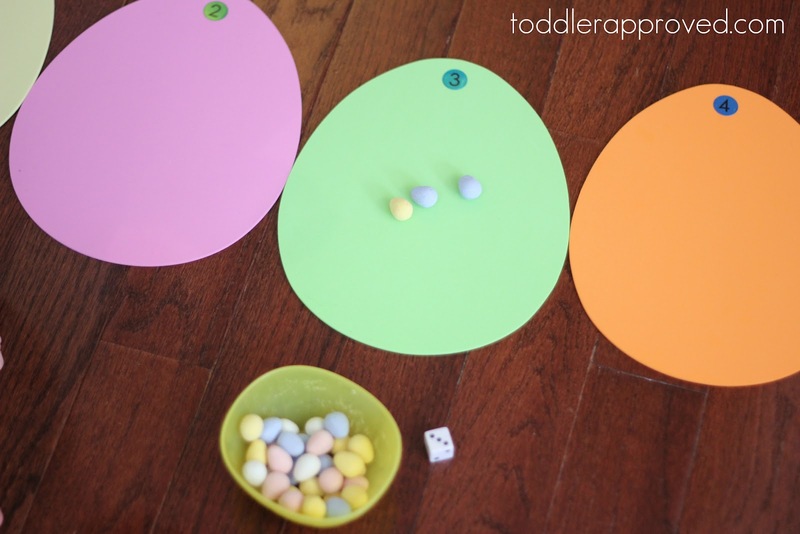 Have child locate the number egg that he rolled and then put that number of candy eggs that correspond with the number on the matching number egg. For example, if he rolls 3, he finds the #3 foam egg and puts 3 candies on it. 3. Once all the foam eggs are covered with candy, roll the die again. Take away candy from the eggs. You can do this in two different ways. For example, if child rolls 3, child can just take 3 candies off the #3 egg... or the child can take candies away from any egg that has more than 3 eggs on it- 3, 4, 5, 6. This way we talked about more than/less than and bigger/smaller numbers and comparing them. This game was a simple way to play around with counting, number recognition, 1:1 number correspondence (the ability to match each member of one set to the member of an equal set), and also introduce subtracting in a very basic way. We used eggs, but this activity could be adapted to any shape. 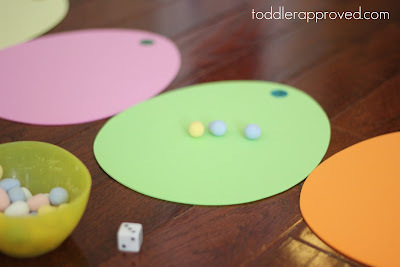 I also shared another fun Spring math activity over at Life Your Way this week. It incorporated some building skills too, so my 4-year-old really loved it. 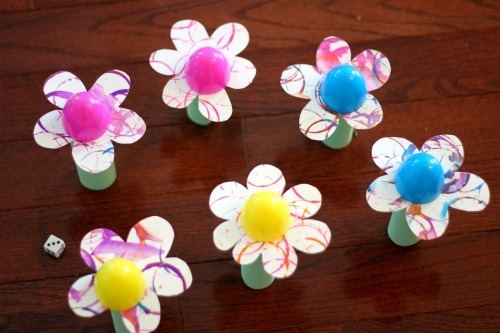 I'd love for you to share a fun Spring themed math activity you've loved, do you have any favorites we missed? Wonderful math activities! Thanks for sharing! Counting is necessary so it was wonderful that my kid should take this! I really enjoy and astonish with the ideas you have! Good heavens you shared this!